We take a look at Apple (AAPL) share price since the start of 2018 and focus in particular on what the moving averages of the company's share price has to say about its potential direction in the short to medium term. The chart below shows Apple's share price since the start of 2018 but we want to focus on the mixed signals provided by its moving averages which might lead to AAPL trading in a sideways range for a while until there are clearer signals as to where it is heading. While AAPL's latest financials reflected a slowdown in sales, in particular blaming slower sales in China, the share price has made a decent recovery after its slow gradual decline starting in October 2018. Below the AAPL share price, with a MACD graphic below it, and a Rate of Change (RoC) histogram below the MACD. We want to focus on two pairs of simple moving averages. The first pair being the 10 day SMA (SMA10) and the 30 day SMA (SMA30). This is often used as an indicator of short term stock price movements. So should the SMA10 cross above the SMA30 it is a bullish sign for the short term price movement of a share. If the SMA10 is below the SMA30 it is a bearish sign for the short term price movements of a stock. The second pair of simple moving averages (SMA) we want to focus on is the 100 day SMA (SMA100) and 200 day SMA (SMA200). Should the SMA100 cross above the SMA200 it is bullish sign of longer term price movements, and should the SMA100 fall below the SMA200 it is a bearish sign of longer term price movements in the share price. The image above shows the SMA10 (which is at $161.9) a share is above the SMA30 (which is at $155.8 a share). This signals positive or bullish sentiment towards the short term price movements of AAPL. Yet when looking at the longer term moving averages, the SMA100 (which is at $188.4 a share) is below the SMA200 (which is at $191.1 a share). So the short term indicators are showing and predicting positive price movements, the longer term moving averages are showing declining prices. 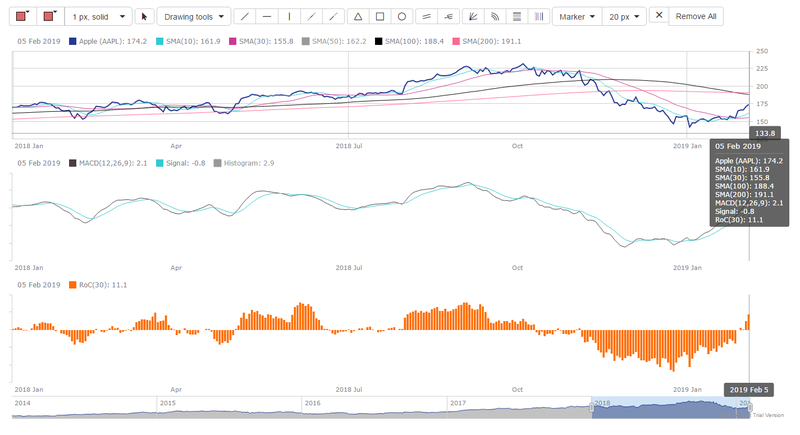 So there are mixed signals for AAPL shares based on its moving averages, and it is for this reason that we predict that AAPL will trade in a range for a while until there are clearer signals as to where AAPL might be heading. The MACD line is still above the signal line which indicates positive sentiment and the RoC is in the positive too. So while we predict AAPL to be range bound for a while we suspect while it might be range bound the bias will be toward the upwards price movement of the share considering there are more short term positive technical indicators than negative ones.